If you want the power of the Synergy platform but prefer to stay with a straightforward, tube amp-based rig, the SYN-30 Single Module 30-watt All-tube Head is for you. 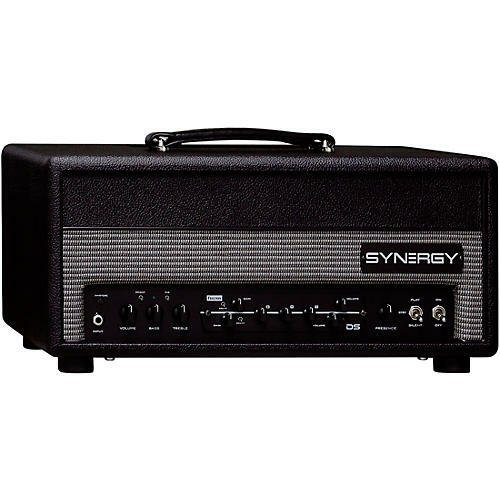 Based around a 6L6 power section, the SYN-30 boasts the perfect power for clean headroom and pushed crunch. The head boasts an onboard clean channel as well as a dock for one of the Synergy preamp modules, offering a total of three footswitchable channels that have been voiced by some of the most legendary amp designers in the business. And while the SYN-30 is as easy to use as any all-tube amp head out there, it boasts immaculate cabinet simulated direct output, MIDI programming, and a transparent effects loop that make it as useful in the home studio as it is on the gig. There's simply nothing like the feeling and sound of a tube amplifier moving air behind you. That's why the engineers put the Synergy preamp module technology into the 30-watt, all-tube SYN-30 amp head. With the head's onboard clean channel and a dock for one of Synergy's preamp modules, you're able to outfit this head with three channels of boutique-quality tone. Four 12AX7s and a 6L6-based power section push the sound of the modules through your favorite cabinet, while global Presence, Density, and Master controls shape the amp's overall character. The SYN-30 brings together classic tube amp performance with the modern flexibility you demand. The SYN-30 tube amp head offers three customizable channels that can be selected on the fly. Try the B-Man preamp module to for early rock 'n' roll crunch. Or maybe you'd prefer the singing sustain of the Soldano SLO module. And swapping the modules couldn't be easier. Simply loosen the thumbscrews and change out the module for a different tone. Add in the glassy tones of the onboard clean channel, and the SYN-30 is a versatile 3-channel head that can handle any performance, session, or playing style. With so much tonal power and so many sonic options onboard the SYN-30, Synergy made sure to offer you two flexible ways to control it. The Synergy 3F 3-button foot controller is essentially a fully programmable MIDI controller. From the factory the three buttons recall the onboard clean channel and the two channels on your preamp module. But with a simple procedure, you're able to program the pedal to your needs. If that still isn't enough, the single module 30-watt all-tube head is fully MIDI capable. And because it accepts both 5- and 7- pin connectors, it works with almost every MIDI controller out there.